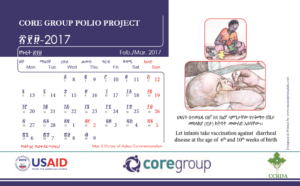 This toolkit catalogs many of the materials created and used by each CORE Group Polio Project (CGPP) country. 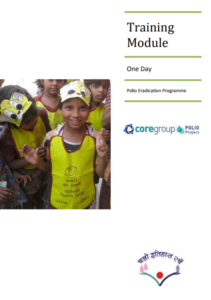 There are community mobilization tools, monitoring and evaluation documents, training resources, and materials for a wide range of polio eradication approaches. 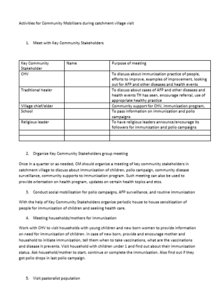 These resources inform, educate, organize, empower, and promote the work of thousands of community health workers who support vaccination campaigns, conduct community-based Acute Flaccid Paralysis surveillance, promote routine immunization, track the vaccination status of under-fives, newborns, and pregnant women, and mobilize communities to actively participate in immunization services. 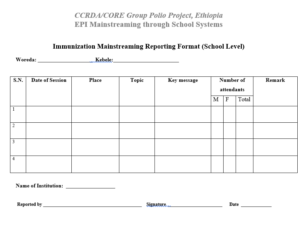 Some of these tools are technical and organizational in scope, such as templates that keep track of activities and record findings during immunization campaigns. 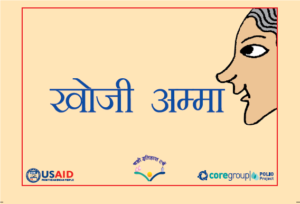 Other tools are used to provide instruction or reinforce health information through interactive discussions; some learning tools are tailored to address low literacy and adapted to country or regional contexts. These tools have been used to lead, support or coordinate the current eradication and disease surveillance efforts in Ethiopia, India, Kenya, Nigeria, Somalia, and South Sudan. While the tools were originally developed by and for CGPP countries over the years, the content of many of these tools can be adapted for practical application to support other health initiatives that aim at eliminating or reducing vaccine-preventable diseases. You can browse the tools below, organized by country. For more information on CGPP or this toolkit contact Lydia Bologna at lydia.cgpp@gmail.com. 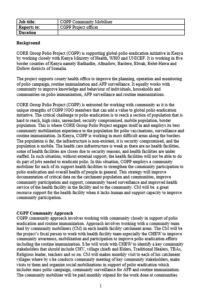 The CORE Group Polio Project (CGPP) is a multi-country, multi-partner initiative providing financial support and on-the-ground technical guidance and support to strengthen host country efforts to eradicate polio. Several CORE Group member organizations work together to implement the CORE Group Secretariat model, a time-tested mechanism for increasing coordination and collaboration. As a result of this collaboration, each in-country secretariat has come together to contribute to the Polio Eradication Toolkit. Languages: Amharic, Oromifa, Somali and English. 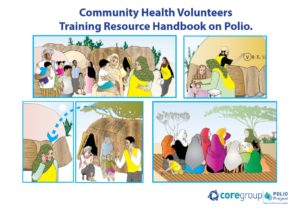 The information provided in this manual supports a three-day training of community volunteers on identifying and tracking Polio, Measles, and Tetanus. This training manual is designed for trainers of Community Conversation Facilitators (CCFs). 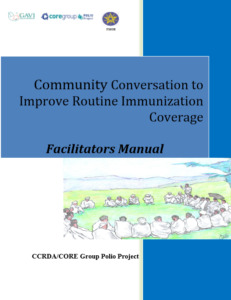 The manual facilitates the transmission and acquisition of Community Conversation skills, concepts, and tools, and improves the understanding of Routine Immunization issues at the individual, community and organizational levels. The goal of this document is to bring fundamental change in people’s knowledge, attitudes and practice on Routine Immunization. It is designed to be used by community groups of about 25 people over a series of two-hour meetings, held twice a month for six consecutive months. The manual is used to support community leaders, Health Development Armies (HDAs), and Community Volunteers (CVs). Languages: English since 2008. Translated into Amharic in 2016. This IEC resource is used by health workers and community mobilizers during house to house and group meetings. 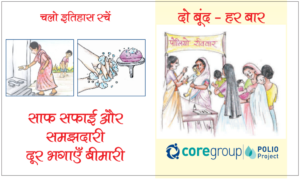 Information about polio and routine immunization is explained and discussed through the use of pictures and informative texts. 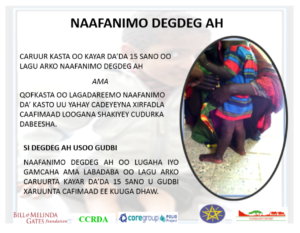 The calendar is printed and distributed to partners at all levels, including the woreda health offices and health facilities at the grassroots level. 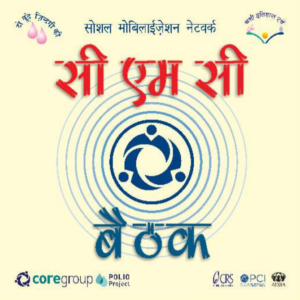 This tool is used as a reference for social mobilization and routine immunization activities. 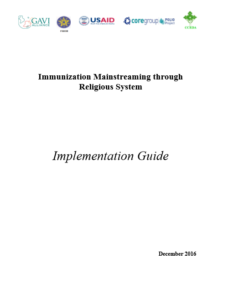 This list of key messages is available to health extension workers, religious leaders, the school community and others to disseminate during EPI mainstreaming activities. Apron, umbrella and bag to hold documents are distributed to community volunteers for use during social mobilization, surveillance, house to house visits and other activities. This plastic bag is printed and distributed for mothers/caretakers in the CGPP Ethiopia program area. 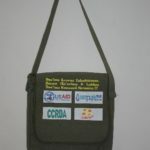 The bag is used for proper handling and retention of children’s vaccinations cards. More than 70,000 bags have been distributed in Ethiopia with an additional 30,000 planned for distribution with funding from GAVI/CSO Support. 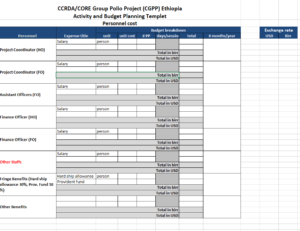 Supervision checklist formats for the partner level, Woreda level, health facility level, and community level. Project field assistants complete this tool during monthly supervision and review meetings with community volunteers (CVs or community mobilizers). Field assistants submit the completed tool to the CGPP Project Officer monthly upon collecting and consolidating the data from the assigned health facilities. 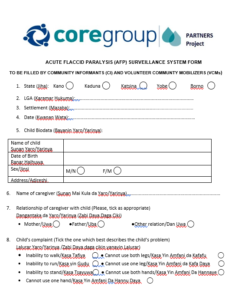 The form collects data on activities and activities carried out by the health facility to manage CVs for polio eradication activities such as for supplementary immunization activities (SIAs), routine immunization, acute flaccid paralysis (AFP) surveillance, and social mobilization. Quality of planning, reporting, and review meetings held. 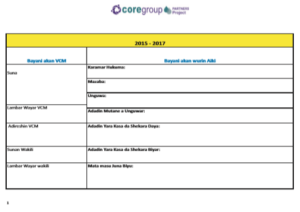 Outcomes of linkages between CVs, Health Extension Workers (HEWs–paid community health workers in the Ethiopian national health system) and their supervisors. The quality of monitoring and supervision of CVs. Health facility staff collect and record data from each CV on monthly activities and are submitted to CGPP field assistants, who review them for quality, provide feedback to the CVs, and compile them into a summary form (see Project Field Staff Monthly Reporting). 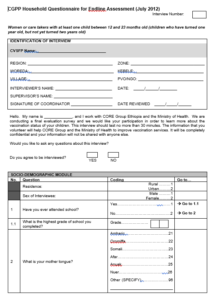 The tool contains three reporting formats: case report format ; CV activity report form; and registration of pregnant women and newborns for polio doses at birth. The case report form collects data on cases of acute flaccid paralysis (AFP), measles, and neonatal tetanus detected in the community, with details on name, age and onset of illness. The CV activity report collects data on: health education; house-to-house visits; community mobilization for RI; and community mobilization for Supplementary National Immunization Days (SNIDs). Health facility staff use the data to monitor and support the work of CVs, monitor and respond to occurrence of key diseases, and reach out to pregnant women and newborns for appropriate care and vaccination. CGPP country programs often use Lot Quality Assurance Sampling (LQAS) methodology for evaluation to see how CGPP indicators are performing. LQAS is a relatively rapid and low-cost approach to data collection compared to traditional surveys. CGPP also uses 30-cluster sampling, which is less expensive and less complex logistically than LQAS, but it does not provide data on the performance of indicators at the sub-project level. 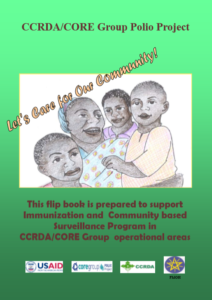 Community health volunteers use this guide during social mobilizations for routine immunizations, polio campaigns and health education sessions for community based AFP surveillance. 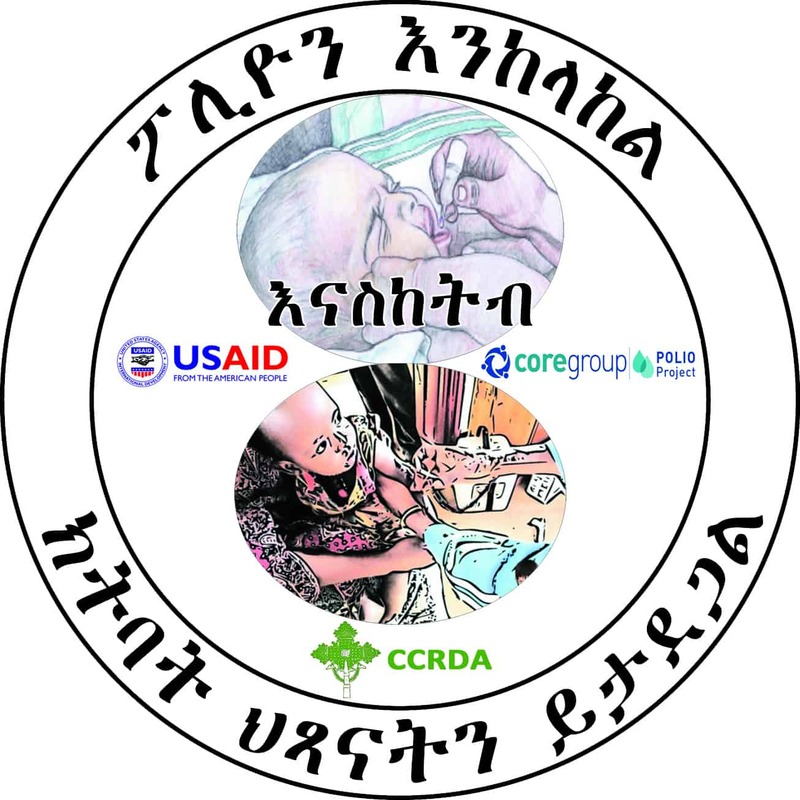 This behavior change communication tool aims to improve knowledge of disease surveillance and the importance of immunizations for vaccine-preventable diseases, breastfeeding and diarrhea management. These pictorial presentations spark discussions among women’s groups, pregnant and lactating mothers, youth groups and others about the importance of children completing their routine immunizations in the first year, the timely reporting of disease events to the nearest health facility and the need for hygienic practices. 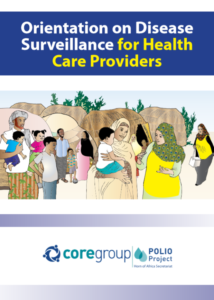 This resource provides training for Somali community health volunteers on polio eradication, AFP surveillance, routine immunization and polio vaccinations campaigns to raise community awareness of the need for immunizations and community surveillance. The flipbook contains five short modules and is used by CHVs to hold community education sessions for other CHVs, traditional healers like birth attendants, religious leaders, village chiefs and elders and school teachers. 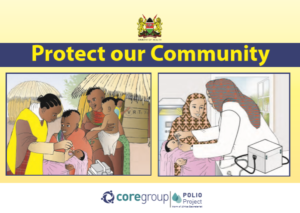 This resource provides training for Turkana community health volunteers to educate families about the polio virus and the need for immunization of polio and other vaccine preventable diseases. 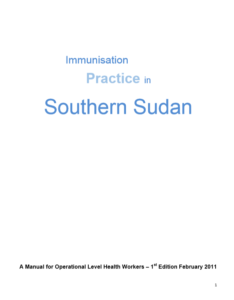 The guide also addresses the importance of supplemental immunization activities and disease surveillance. 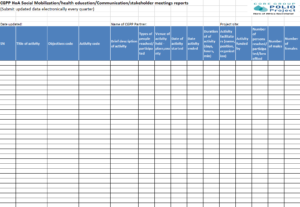 Community mobilizers use this checklist to monitor the quality of their work. During their visits to village health facilities and village pastoralist population settlements, community mobilizers track their meetings with key community stakeholders (traditional healer, village chief or elder, religious leader, etc) and conduct household sessions for mothers to boost social mobilization for polio campaigns, AFP surveillance, and routine immunization. 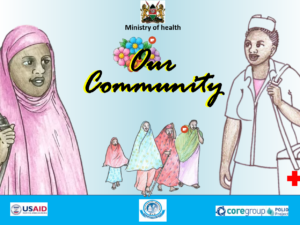 Community mobilizers are community-based project team members who support county health officers to improve knowledge and address behaviour of individuals, households and communities on polio immunization, AFP surveillance and routine immunizations. The TOR lists the roles and responsibilities of the Community Mobilizer and is used to recruit and screen community mobilizers for employment. This mapping tool lists details for each health facility, indicating the total population segregated by age (male, female, under 15, under 5, and under 2 years). It also indicates the number of AFP cases reported, number of polio vaccine doses given (segregated by monthly targets) and records confirmed polio disease cases in border settlements. Cross border health committees collect this information for AFP surveillance, routine immunization and population distribution of border settlements and villages. 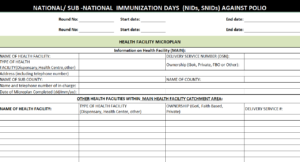 This extensive, 10-form document supports microplanning for SIAs at health facilities to improve the planning, operation and monitoring of polio campaigns by providing a comprehensive list of catchment villages, cross border villages and border crossing points; a detailed health facility catchment area map; vaccination team plans; map of cold chain systems; ACSM plan (Advocacy, Communications and Social Mobilization), health facility staff and supervisors contacts and profiles of CMs/CHVs. This tool provides a list of catchment areas (villages, settlements, towns) and the estimated population of each area. Peripheral and border health facilities staff use this guide to develop micro plans for health services delivery. 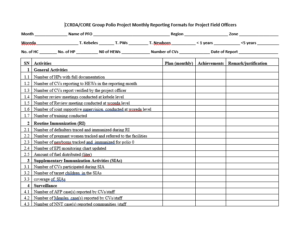 This form was developed to track and record all social mobilization activities conducted by CGPP field teams. It captures the social mobilization objectives and the person reached, the venue, and data and duration of the activity. 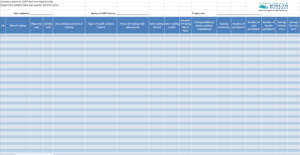 This is an M&E tool developed for tracking and keeping record of all CGPP-HOA training activities in the project areas, including the objective and type of training as well as pre-test and post-test scores of participants, and is used at the end of each quarter to inform programming. 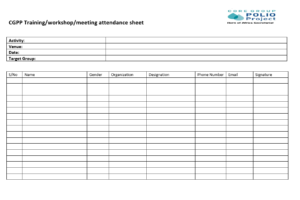 This meeting attendance sheet records name, gender, representative organization/agency, position and contact information of meeting participants. 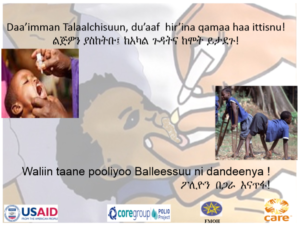 This two-part basic training module was designed for frontline health staff who provide services through dispensaries and health centers as well as for community mobilizers who could benefit from refresher courses on polio disease, AFP surveillance, and routine immunizations. The document supports health staff with necessary knowledge and disease case definitions to support disease surveillance (including AFP surveillance), strengthen health service delivery and improve immunizations coverage in their catchment populations. The dangler is suitable for hanging in small neighborhood stalls or shops in settlements and other communities. It carries a key message in Hausa promoting Polio and Routine Immunization. It shows the symbolic two drops of polio vaccine on one side and a syringe symbolizing routine immunization on the other side. The streamer is suitable for hanging permanently in health facilities or temporarily at health camp sites or outreach locations during immunization sessions. This tool improves knowledge of Vaccine Preventable Diseases (VPDs) and has been used as a reference during educational sessions with volunteers. Volunteers use the flip book as their main tool to promote healthy behaviors when mobilizing mothers/care givers during house visits and community engagements. Each page contains illustrations of VPDs and their appropriate vaccines as well as important messages for the antenatal care of pregnant women, malaria prevention, handwashing, and more. The Certificate recognizes and rewards excellence by program staff at the implementation level. 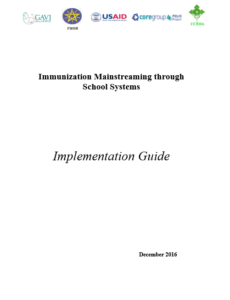 The pamphlet contains Frequently Asked Questions (FAQs) and answers to respond to common immunization-related issues such as vaccine safety and frequency of immunization. This helpful tool directly addresses concerns about whether the vaccine in Nigeria is different from vaccines given in other parts of the world, why the vaccine is provided without charge, and why the vaccine is provided at home. 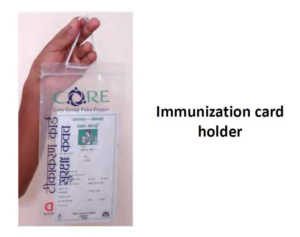 The Immunization Card Holder is made from see-through material to safeguard the Routine Immunization (RI) Card. 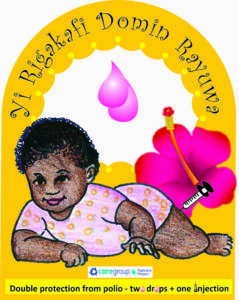 The card holder carries a message in Hausa reminding mothers of the necessity to protect children through immunization. 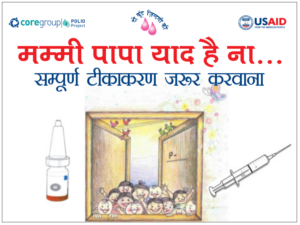 The ‘Stop Polio Now’ message promotes immunization while the CGPP logo enhances the program’s visibility. 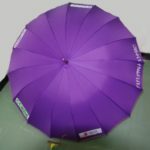 It is worn by program staff and key stakeholders at the local, state and national government levels. It is also given as a reward to high-performing frontline staff like VCMs. Program volunteers and community informants have been trained in Acute Flaccid Paralysis Case Detection (AFP Surveillance). 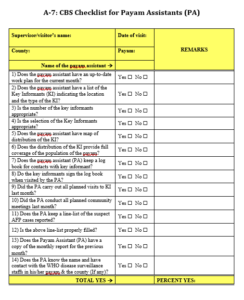 Volunteers and informants use this form to document any AFP cases at the settlement/community level. The form is used to measure the performance of volunteers in AFP surveillance. The checklist is used to conduct rapid assessment of Routine Immunization (RI) of health facilities located in the three CGPP RI implementing states. It is used to identify any gaps and to propose solutions to these gaps. Senior supervisors complete this form while supervising Immunization Teams during Polio Campaigns or SIAs. Supervisors assess the various components of the campaign such as the composition of the Immunization Team, the availability and quality of the microplan, performance of the team, etc. 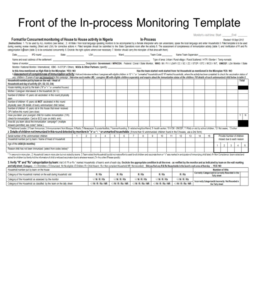 This monitoring form is administered by trained personnel that are independent of the program to assess the quality of campaign (SIA) during implementation. House numbering, number of children not immunized or missed, vaccine rejection and proper child age categorization are captured in the form. 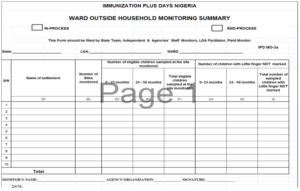 This monitoring form is administered by personnel independent of the program during immunization campaigns. Settlements are selected randomly for a survey to determine the percentage of missed children by sampling children under 5 years for evidence of vaccination. Children are selected outside the selected settlements and categorized as 0 – 23 months and 24 – 59 months. A repeat immunization campaign specific to that area (known as a mop-up) is recommended if more than 10% of sampled children are missed. The mop-up is conducted on the fifth day of the campaign by deploying immunization teams to revisit the homes of missed children. 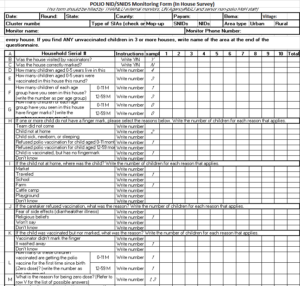 After administering the Outside Household Monitoring Survey (see above), this form is used at the Ward level to collate and summarize the total number of settlements, sites selected, children sampled, and numbers of missed children. 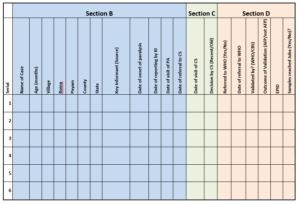 This self-assessment tool is used to determine the level of work completed. 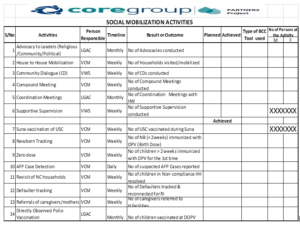 This template collects information from the project areas on monthly social mobilization activities to plan and evaluate future activities. 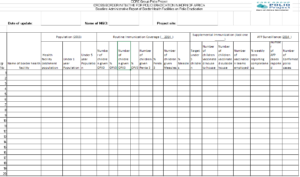 The VCM register is the main routine data collection tool designed for volunteer community mobilizers (VCM) at the settlement level. The front page indicates the settlement, Ward and LGA. VCMs have been trained and supervised to record numbers of children immunized with Polio vaccine and other RI antigens. The register is simple to complete and lists all children under 5 years within the settlement. The second part captures immunization data during polio campaigns. The third section indicates the date a child in the register receives a vaccine. The VCMs are also mentored to capture special events that occur in-between rounds. Coded 1-10, these 10 special events include in-home events such as pregnant women and naming ceremony and those child-specific such as referral, malnutrition, AFP, measles, etc. 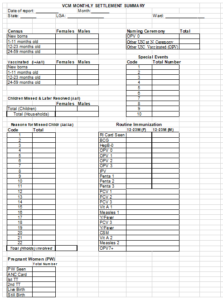 The summary sheet is used by Ward supervisors to collate data from the VCM register each month by segregating the total under-five children in the register by newborn, 1-11 months, 13-23 months and 24-59 months. 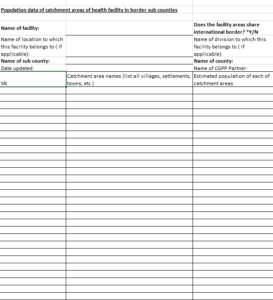 Data is collated on SIAs, RI, special events and others. 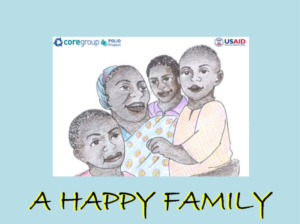 Community mobilizers use this flipbook to facilitate health sessions during home visits and mother’s meetings to encourage adoption of healthy behavior towards immunization. 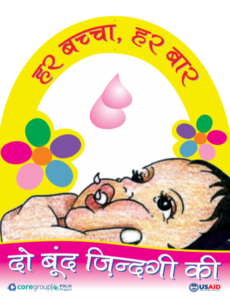 The flip book promotes key messages about breastfeeding, routine immunization, good hygiene practices, diarrhea management and polio eradication. 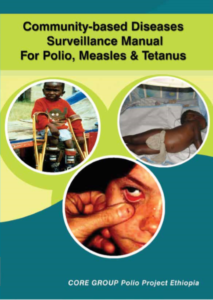 This manual was developed by the Ministry of Health to provide managers and service providers at all levels with information to plan, deliver, monitor and evaluate quality immunization services. The social map provides county-specific data on inhabitants and languages spoken and summarizes the common challenges faced by residents. 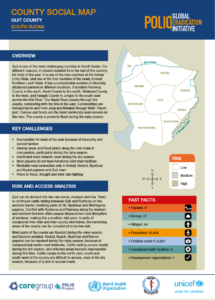 It highlights areas affected by insecurity, poor infrastructure and flooding. It also provides risk and access analysis, population information, an overview of health facilities and the communication interface. This document provides Independent Monitoring coordinators and supervisors with global implementation guidelines for independent assessment of the quality and coverage of supplemental immunization activities (SIAs). The guidelines outline a cluster survey methodology adapted from the WHO EPI Coverage Surveys. The monitoring team applies these guidelines during all SIAs and submits the data to the CGPP Secretariat for entry, analysis and sharing to guide subsequent polio campaign rounds. Data is used to take immediate corrective actions, if needed, and to plan upcoming SIA rounds. The guidelines have four clearly laid-out sections: 1) pre-planning activities; 2) data collection tools, analysis and presentation; 3) field work and 4) report template. 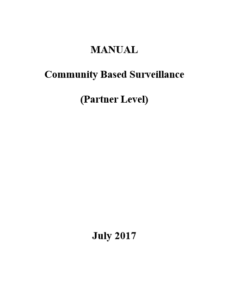 This manual helps harmonize all Community Based Surveillance (CBS) activities across field locations and contains minimum standard operation procedures for CBS implementation in conflict-affected areas. It is used as a guiding tool by field staff, including County Supervisors and Payam Assistants. This manual is a comprehensive guide to Community Based Surveillance activities in conflict-affected settings. It provides an overview of the minimum standard operating procedures used in the boma level through the national level. This manual is to be used for operational purposes by partner’s project officers, managers, M&E officers, CGPP staff and Bill and Melinda Gates Foundation field consultants. 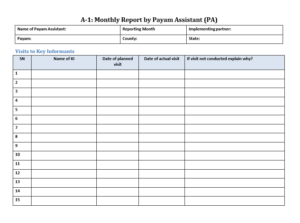 County Supervisors use this monthly reporting form to record the work of Payam Assistants (PAs). County Supervisors submit the completed form on the fifth day of the subsequent month to partner’s project officers for review. It is then forwarded to M&E officers for compilation into a consolidated partners report. 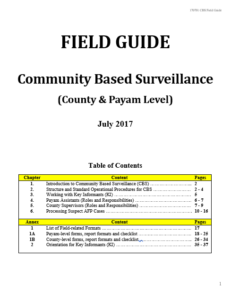 This report contains support supervision visits to payams, summary of field supervision check list scores, county-level activities and consolidation of Payam Assistants monthly activities, information on suspected AFP cases reported during the month, summary budget of received and spent funds, and challenges encountered during the month. This monthly reporting tool is completed by Payam Assistants and submitted to the County Supervisor to record monthly activities conducted at the payam and boma levels. It also contains documentation of support supervision visits conducted by Payam Assistants to Key Informants and to community meetings and community awareness sessions. The tool collects information on any reported cases of AFP and cites challenges encountered during the month. 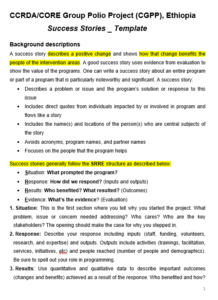 This reporting form is specifically tailored to meet the needs of illiterate community volunteers and mobilizers. Presented in a pictorial format, the document enables uneducated mobilizers or those with low literacy skills to accurately record data by indicating completed activities. Community mobilizers then submit the form to Payam Assistants. The form records data on maternal health, newborns, child vaccination, cases of acute flaccid paralysis, health education and home visits. CGPP County Supervisors and project officers use the data to monitor the performance of the essential community health volunteer component of the program. 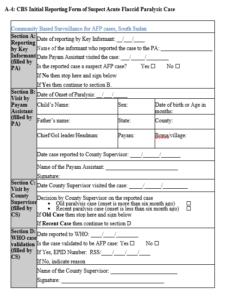 This form is used by County Supervisors to provide information about suspected AFP cases that have been reported by key informants and verified to be true AFP cases. The information on this form is then transferred to the AFP line list that is sent at the end of each month to the partner’s head office. The IRF contains information on the reported AFP cases, demographic information, dates of reporting, verification visits by payam assistants, county supervisors, outcome of the reported cases (old or new), date reported to WHO field staff for validation, EPID number and signature to confirm that the case has been validated. This form is used to record information from the individual initial reporting form by line listing every AFP case that has been reported. The form is usually completed by the County Supervisor by transferring the information from the IRF and submitted to the project officers at the end of each month as a summary of all cases reported during that reporting month. 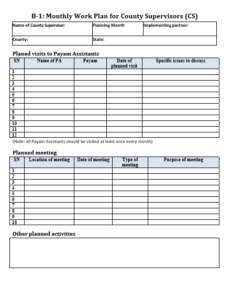 Payam Assistants use this form to plan their monthly activities and then submit completed forms to County Supervisors at the end of the month. 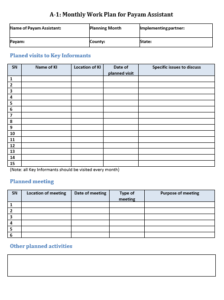 This form contains information about the Payam Assistant, the area where he or she is working, implementing partner information, month of reporting, planned visit to key informants including the list of the key informants to be visited, locations and date of planned visit, specific issues discussed, information on planned meetings during the month and other planned activities. 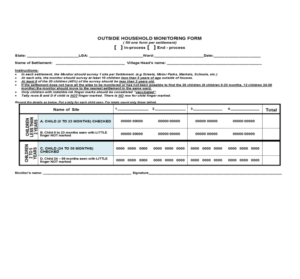 County Supervisors use this form to plan their monthly activities. The form is completed by County Supervisors at the end of the month and submitted to partners project officer along with their monthly reports for the subsequent month. This tool contains information on the name of the county supervisor, month of planning, implementing partner, county, state, information on planned support supervision visit, planned meetings at the county level and other activities to be performed by the County Supervisor during the month. This is a tool used during support supervision conducted to Payam Assistants. 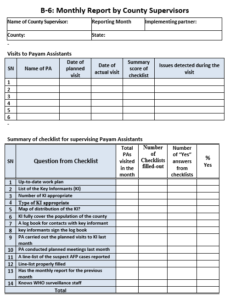 It contains the supervisor name, county, payam, date of visit, name of Payam Assistant supervised, set of questions about the work performed by the Payam Assistants, responses to the questions, scores and remarks. 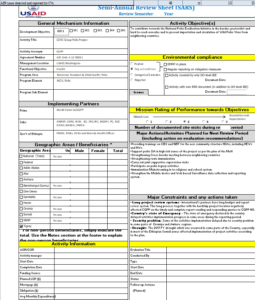 This tool can be used by any CGPP officer visiting the Payam Assistants to assess their performance and recommend action to improve field work. County supervisors utilize this tool during support supervision. It lists details such as the name of the supervisor, county, payam, visit date, name of Supervisor visited, questions and responses about the County Supervisor’s work, scores and remarks. CGPP or partner officers visiting the County Supervisor can also use the tool to assess performance and make recommendations. This is a consolidated field movement plan that combines the planned visits by all implementing partners CGPP secretariat staff and BMGF consultants. This tool is sent to the Secretariat at the last month of the quarter and is reviewed during the monthly partners meeting for endorsement to be used as a final field visit planner. The second part also contains a consolidated report on all actual field supervision and movement conducted during the quarter. This tool is reviewed monthly to update any changes that are anticipated to happen during that particular month. It contains the names of the counties to be visited and the counties already visited, planned dates and actual dates of the visit, partner names and the name of the person visiting. This template was developed to share information between the implementing partners and CGPP Secretariat State Coordinators. This tool is completed by partners project officers and CGPP State Coordinators who are tasked with supervision of field activities. 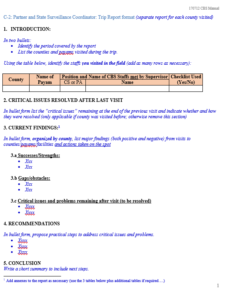 The template contains introduction about the field visit, critical issues resolved after last visit, current findings in the field, recommendations and conclusions. 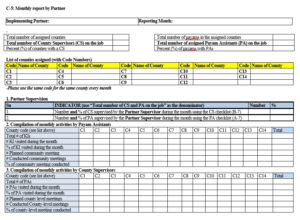 This monthly report template is specifically designed for implementing partners to consolidate all county level reports into a single report for submission to the CGPP Secretariat every 10th day of the subsequent month by their M&E officers to CGPP Secretariat M&E Coordinator. 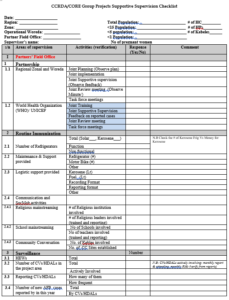 The reporting template lists the name of the implementing partner, month of reporting, basic information on field staff, list of counties supported by the partner who reported during the month, summary of support supervisions, compilation of PA and CS activities, budget summary, summary information on reported AFP cases, challenges, action plan and plan for next month’s supervision by the partner. This template was developed to track quarterly county by county budget by the implementing partner and shared with their various counties comprising of the county annual approved budget divided into four quarters, line items budgeted both in USD and local currency. 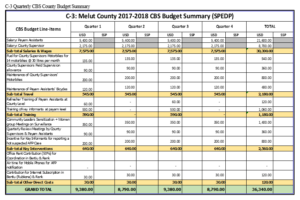 This budget summary is used by partners and CGPP Secretariat to ensure that counties spend according to their approved budgets and used by county supervisors for planning and requesting their quarterly budgets from their head offices. This also instills spirit of accountability and transparency between the partner’s head office and the field (counties). 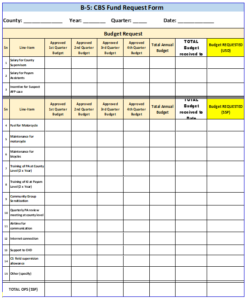 County supervisors use this budget template to request funds each quarter. It contains the name of the county, year, quarter, date, budget line items, amount requested per quarter, and currency of requested funds. This document is sent to the partner’s head office in the last month of the quarter for the subsequent quarter and reviewed by the project officers directly supervising that particular county supervisor to ensure that what was requested has been budgeted for and in line with the approved amount for the quarter. Implementing partners and the CGPP Secretariat use this form to monitor the transfer of funds by partners to support the county budget. It lists basic details such as the name of the county that receives the funds, the purpose of the transferred funds, approved quarterly county budget, the exchange rate of the local currency and balance of funds. 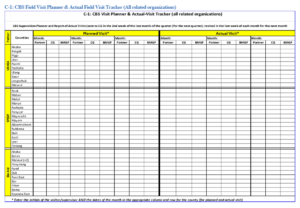 County Supervisors use this form to track funds received by quarter. The form lists basic details such as the county name, time period, budget line items, date of transferred and received funds, and the type of currency of the transferred monies. Funds spent at the county level are verified by the CGPP Secretariat Grants & Compliance Officer, State Coordinators and BMGF field consultants during their field visits. 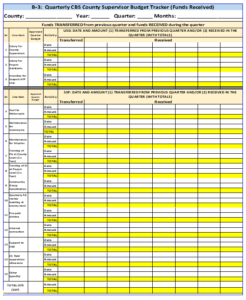 County Supervisors use this form to track funds spent each quarter. The form lists basic details such as the county name, time period, budget line items, date funds spent, actual approved budget per line item and the type of currency used. Funds spent at the county level are verified by the CGPP Secretariat Grants & Compliance Officer, State Coordinators and BMGF field consultants during their field visits. This form collects data on the immunization status of children under five years old who can be found outside their houses, such as in markets, schools, streets and churches. This data validates in-house data collection to better reflect NIDs coverage. It is divided into two parts: Part A captures geographical information and Part B contains a series of questions regarding the immunization status of children under five years and social mobilization activities. 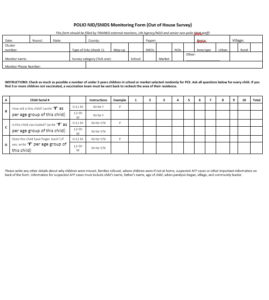 This form is used for collecting data during house-to-house polio campaigns. It records the immunization status of children under five years within selected areas based on finger marks. It also records data to monitor the work of social mobilizers before the polio immunization campaign and the work of vaccinators who move from house to house immunizing children. This form is divided into two sections: the first part collects information on geographical characteristics of the clusters/boma, and the second part contains a series of questions on the vaccination status of children, reasons for missed children and social mobilization activities. 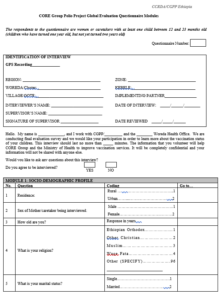 Vaccination teams use this form to record daily information on children who receive OPV at special vaccination posts. The form lists details such as the name of the state, county, payam, and type of vaccination site. It also includes basic details such as the name of the child, age group, gender and whether the child previously received OPV. 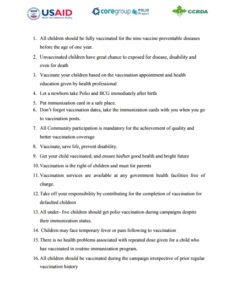 A separate section contains a summary of the information about the vaccinated children and the number of OPV vials received, used and returned to the health facility. 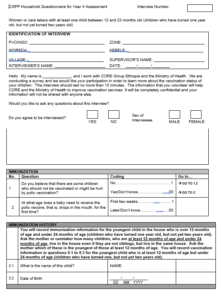 Developed jointly by WHO South Sudan and the CGPP Secretariat, this form is used by vaccination teams to record one dose of oral polio vaccine administered to children under 15 years who are crossing state or international borders. The tool is divided into two sections: children who have received polio vaccines before and children who have never received oral polio vaccine, or zero dose children. The tool is further sub-divided by gender and age groups: 0 to 11 months, 12 to 59 months, and 60-179 months. The form lists county, payam, state, name of vaccination site, and type of the special vaccination site (international or interstate). 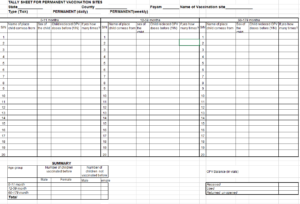 This monthly special vaccination post report form is generally the summary of the information contained in the special vaccination posts tally sheets. Frontline workers in polio eradication strategies benefit from regular training and consistent supervision to boost their skills, competence and confidence. Trained community health workers (or community mobilizers) are essential to ensure demand for and quality of community-based activities. Important competencies for community mobilizers include interpersonal communication and counselling skills, use of job aids and educational tools, and record-keeping. Community workers are typically trained by their supervisors, who also have been trained. This section contains the following trainers’ guides (training modules) and other tools used in training, which CCGP and its partners developed and use for education community mobilizers. Trainers of community mobilizers use this intensive three-day capacity-building program to impart knowledge and skills in social mobilization activities for polio eradication. The training is highly interactive and uses a variety of training methods, including group work and participatory sessions, problem-solving exercises, games and role plays. Trainers conduct the training annually. The use of registers for recording up-to-date information on households and institutions in a mobilizer’s catchment area for planning and implementing social mobilization activities. An expanded four-day version for training of trainers also covers participatory training methods, facilitation skills, and needs assessments. Trainers use this one-day module to build the capacity of community mobilizers to conduct social mobilization activities and overcome communication challenges in the event of a polio outbreak in areas where the CGPP is not implementing an ongoing program. The training uses participatory approaches to familiarize trainees with poliovirus and its spread, mop-up campaigns, strategies for effectively communicating with community members and involving community leaders, and developing area maps for activity planning. 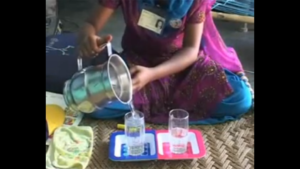 This film shows community mobilizers conducting mobilization activities to support skill development on the ‘polio communication package.’ In the film, community mobilizers demonstrate interactive group meetings and individual household sessions. Content focuses on the science of polio and its spread and routine immunization and its link to polio. Mobilizers also model communication on challenging topics including immunization of sick children and the reasons why vaccinated children may still contract polio. This booklet provides community mobilizers with detailed project messages in a convenient eight-frame, one-page pamphlet. Trainers supply each mobilizer with a booklet during annual training sessions. The booklet serves as an easily accessible reference guide for mobilizers as they carry out activities in their communities. 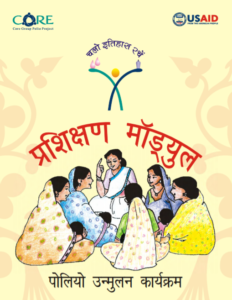 The booklet contains key messages on polio immunization, vaccine-preventable diseases and routine immunization, diarrhea management, hygiene and sanitation, and breastfeeding. Community mobilizers use these Flash Cards for interpersonal communication sessions and group discussion about polio eradication and immunization. These flip books are used by community mobilizers mainly during group meetings and one-to-one communications. 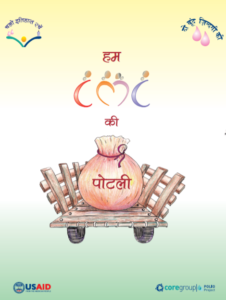 The flip book has information on polio, routine immunization, diarrhoea management, handwashing and sanitation. These charts are used by community mobilizers mainly during group meetings and one to one communications to know about present behaviour. 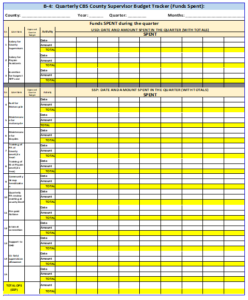 The charts list behaviours aabout polio, routine immunization, diarrhoea management, handwashing and sanitation. Learning while playing: Played by two or more players, the object of the game is to navigate one’s game piece from start to finish through rolling the die. 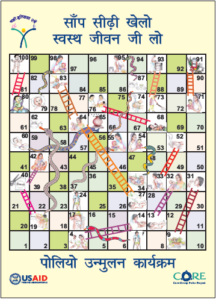 Each square depicts pictures that promote healthy or poor behaviour. Players discuss the messages depicted in the pictures. Community mobilizers use this banner during group meetings. 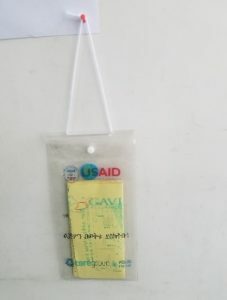 This informative dangler is used at polio booths and immunization session sites. It contains information on the total number of eligible children and the number of children due for polio and other immunizations. Involving children as mobilizers is a colourful and effective way to increase coverage, educate the next generation, and instill a spirit of community service that can be tapped for other child health challenges. Community mobilizers in CGPP/India partner with school teachers and students in social mobilization. Activities include classroom talks, rallies for SIAs and for hand washing and sanitation. Community mobilizers organize school children into bulawa tolis (children’s brigades). These groups conduct a rally prior to each polio vaccination round, and on the vaccination day, to attract the attention of caregivers and children to the vaccination booth. The brigades sing songs about immunization and call out to mothers by waving flags. 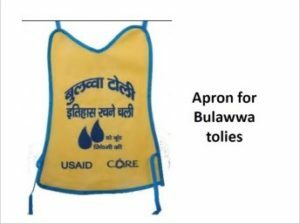 Members of children’s brigades wear these aprons during rallies and on the booth day of Supplementary Immunization Activities. 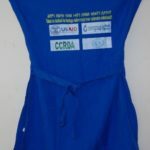 The aprons allow the community to recognize the role of child mobilizers and boost the morale of the children. 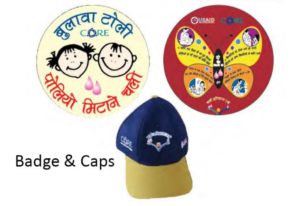 The badges and caps serve to further strengthen the presence and role of the child mobilizers. 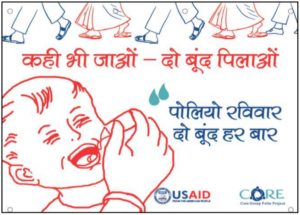 Child mobilizers use these placards during children’s rallies that are held monthly before each polio vaccination round and in between polio rounds to promote other messages. 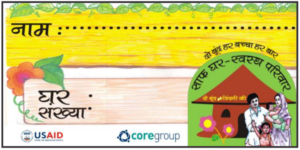 This tool is a creative way for children to learn about polio, open defecation, and hand washing by coloring each sheet during fun classes conducted in schools. 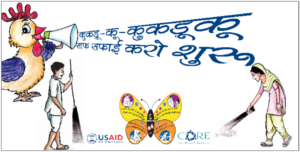 Community mobilizers distribute these nameplates to encourage families to use toilets for defecation. 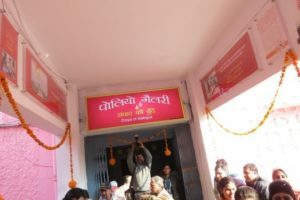 Communities feel proud to show that they are using toilets and that this practice is appreciated. CGPP/India developed and uses a wide variety of materials to encourage and reinforce practices necessary for polio eradication. These ranged from fun, discussion-sparking games to practical tools to encourage household and community pride in adhering to promoted practices. This booklet is distributed to influential leaders to remind them of the importance of disseminating “polio plus” messages. 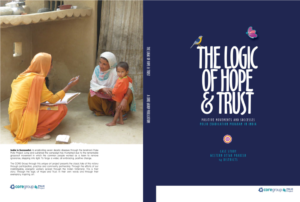 It contains simple information explaining the links between polio eradication and exclusive breastfeeding, routine immunization, diarrhea management, and hand washing. Each of four charts give more detailed information on the four topics. Key messages: Rationale for exclusive breastfeeding, hand washing, routine immunization, and diarrhea management is important for polio eradication. This certificate is awarded to all influential people in the community to recognize their support and contribution in a polio eradication program. 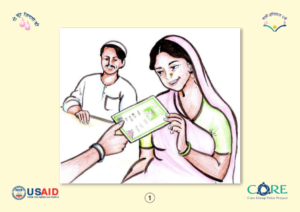 Community mobilizers use this card during one-to-one communication with mothers of every newborn in the community, and mothers keep the card with pictorial reminders on timely immunization. 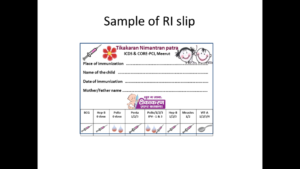 It registers the child’s basic information and date(s) of immunization, and includes a place for the child’s photograph. 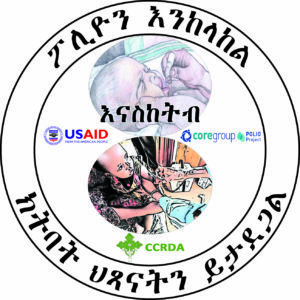 Key messages: Routine immunization schedule and record, messages on Breastfeeding, timely immunization and Vitamin A. 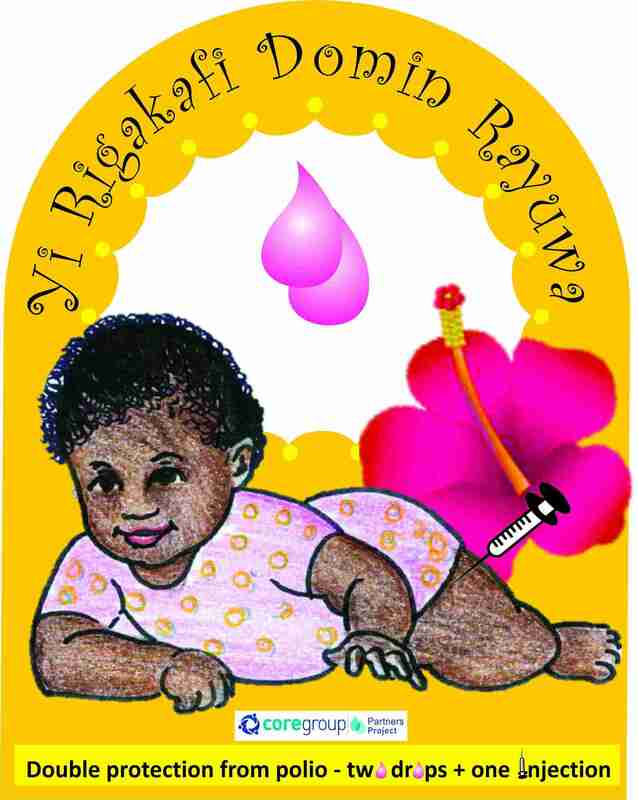 Community mobilizers give this plastic pouch to mothers of newborns together with the congratulatory card. It keeps both the government immunization card and the congratulatory card safely. Some mothers keep important papers along with the immunization cards. Data show that there is a high retention of the immunization card. Community mobilizers distribute this leaflet during polio booths, health camps, and other group meetings. They also use it for one-on-one communication. Community mobilizers distribute one “package” of 20 paper soap strips to community members to encourage hand washing with soap. The package has pictorial reminders of when and how to use soap. This invitation slips are given to each child mentioning the due antigen along with child’s and parents name. It is distributed prior to polio campaign and routine immunization sessions. This pocket flip books are distributed to community members after mother or father’s group meetings and during one-to-one communications. 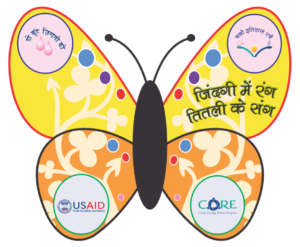 The flip book has information on polio, routine immunization, diarrhea management, handwashing and sanitation. Pastoralists, migrants and seasonal workers and their families who regularly cross national borders are among the most difficult to reach populations. 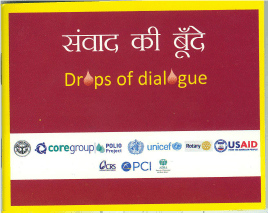 CGPP/India displays these materials at polio booths and immunization sites. The banner is a reminder to immunize all children. Key messages: Anywhere give two drops and immunize routinely. CGPP/India, in collaboration with local health authorities, sets up polio vaccination booths in villages and other sites such as bus stands and train stations during campaigns and SIAs. Colorful materials announce the date and location of the booths. CGPP/India also conducts “health camps” in communities where complaints that polio immunization receives preference over the communities’ other health needs. 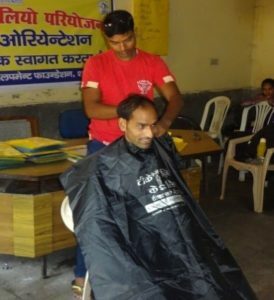 In addition to immunization, health camps provide consultation with primary health care providers and free medicines along with ORS distribution, de-worming, vitamin A, and other services. Outreach and engagement of Muslim and Hindu religious leaders is another key component of social mobilization. Mosques and temples often offer space to vaccinators to set up booths on their premises. Community mobilizers complete the planner with campaign targets (such as number of children under five to be immunized) and hang the planner in their vaccination booths during a campaign. Key Message: This is the time to write history. 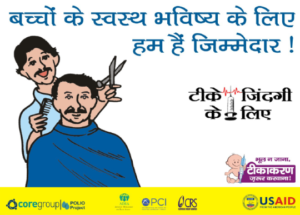 Moving towards a polio-free India Streamers with attractive messages on exclusive breastfeeding, routine immunization, polio immunization, diarrhea, and hand washing decorate polio booths, routine immunization sessions, and group meeting venues. Key Message: Welcome to this immunization session. This is the time to act on your responsibilities. Key Message: Babies future also relies on our hands. This rate card has pictorial information on polio and other vaccinations. It also has information about anywhere you go by train or bus give two drops and injections. Key Message: Be a responsible citizen, adopt healthy behavior. Monitoring and evaluation (M&E) are central to the successful design and implementation of polio eradication programs. Ongoing monitoring allows managers to identify potential problems and make informed decisions about corrective actions. Monitoring also lets stakeholders’ views be known to managers. Evaluation can determine the extent to which the project can achieve its goals and objectives and provide guidance for planning future projects. M&E of polio eradication program deal with performance indicators of technical as well as managerial program areas and include an information system that collects, stores, analyses and presents the information to help decision making. The information system consists of various recording and reporting tools, a flow of data and information, management of data at various levels of collection and use, and a governance system to the use and security of data. Information technology, such as computers and mobile devices, is an integral part of the information system. A user-friendly monitoring & reporting system has been established for CGPP catchment area. 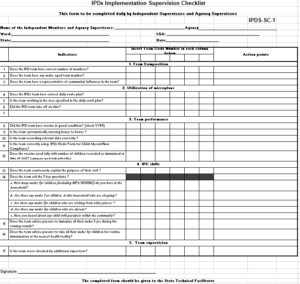 Block* level: Block Mobilization Coordinators (BMCs), who oversee the work of CMCs, use this set of recording and reporting forms to coordinate the project activities and to supervise CMCs. An introductory format with general information on the work area and an annual summary accompanies the 12 data collection formats. Data collected include: SIAs, routine immunization, CMC activities, AFP surveillance, and BMC plans and achievements. The BMCs use the data to monitor the project performance in their block areas and to develop plans for the following month. Reporting formats have carbonless sheets that are provided to district mobilization coordinators every month. District level: District Mobilization Coordinators compile data electronically received from their Block Mobilization Coordinators. A Monthly District Progress Report – a combination of quantitative and qualitative reports – is sent to Sub Regional Coordinators every month. County level: CORE Group Polio Project receives a monthly progress report from each sub regional coordinator, representing the consortium members of ADRA, PCI and CRS. A quarterly report is sent to the CORE HQ with a description of various communications, capacity building activities, networking, and partnership and program challenges. *A block is the equivalent to a sub-district in India. Regular supervision of community volunteers and community-level workers helps to ensure high-quality polio eradication programs. Supervision allows program staff to collect data on quality, to assess reasons for lapses, anticipate future problems, and put solutions in place. It also reinforces CVs’ training, boosts their confidence, and increases their morale. 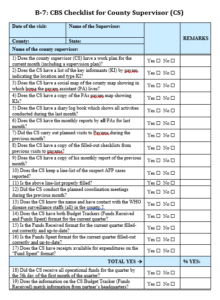 BMC or any higher-level project staff uses this set of checklists monthly to supervise CMCs. The four checklists review: the CMC register and home visits and SIAs; interpersonal communication; group meetings; and routine immunization. Supervisors collect data through review of the register for appropriateness and completeness, observation of the CMCs in the community, and home visits to interview mothers on their interactions with CMCs and to verify immunization status. The tool helps the BMC to assess the quality of the CMCs’ work and identify ways to support CMCs, address weaknesses, and reinforce strengths. CGPP country programs often use Lot Quality Assurance Sampling (LQAS) methodology for evaluation to see how CGPP indicators are performing. LQAS is a relatively rapid and low-cost approach to data collection to use instead of traditional surveys. CGPP also uses 30-cluster sampling, which is less expensive and less complex logistically than LQAS, but it does not provide data on the performance of indicators at the sub-project level. This small pocket book provides the history of polio eradication in India. 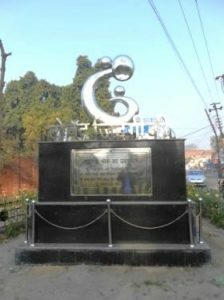 CGPP established the world’s first Polio Square (Chowk) in Moradabad, UP as a tribute to civil society’s contribution to polio eradication. The monument is comprised of a large mother/child sculpture surrounded by the slogan “2 drops of life.” At the base of the monuments sits a “polio vial” with four panels describing the history of the polio effort in India, an acknowledgement of partners, and other key messages including the eradication strategy. CGPP established the first-in-the-world art gallery at the district hospital in Moradabad on 15th of Feb 2014 that captures the journey of the polio eradication program in India. Community members from various districts of Uttar Pradesh display handicrafts as a symbol of the community’s commitment to and partnership with the program. 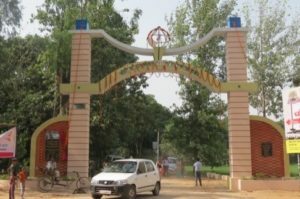 Polio Gate is located in District Muzaffargarh, Uttar Pradesh, India.